Esta foi a espetacular imagem da claque do Benfica no jogo 'Benfica - Porto' que foi destacada ontem pelo prestigiado jornal inglês The Guardian. "The sun catches the No Name Boys or Иo Иame Boys as they bask in the light and flare smoke during Benfica against Porto on Sunday. The group was formed in 1992 and gather in the south corner of the Estádio da Luz, known as Topo Sul. 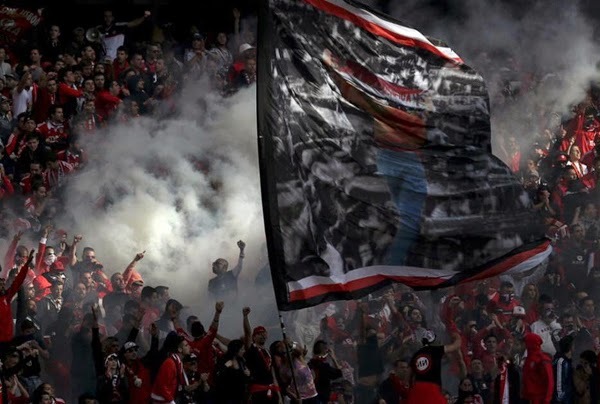 Created after disagreements in another Benfica’s supporters group, Diabos Vermelhos, the group attempted to call themselves ‘The Diabos Vermelhos’ but found that name was already registered. Therefore, they became a dissent group with no name: the ‘Иo Иame Boys.’"
E com o Gulit na bandeira,grande homenagem.